Combine glorious Alpine panoramas with a wide range of activities, and you have the perfect ingredients for a fun-filled family holiday. You stay in the picturesque Austrian village of Strobl, on the eastern shore of Lake Wolfgang, and one of the prettiest spots in the region. During your time here we provide a wide selection of fully researched self-guided walking and cycling routes, typically with a level 1 activity rating. To ensure total flexibility, we give you a complimentary Headwater bike for your exclusive use throughout your stay. There's also excellent local bus, ferry and cable car services (payable locally) linking the local lakes and villages. You stay as guests of Frau Zopf at the **** Hotel Bergrose. Set back from the river, and less than five minutes' cycle from the lake, the attention to detail is second to none. All of the 32 spacious bedrooms are beautifully decorated and the perfectly crafted wooden panelling, so typical of this region, extends right through the hotel. Chef Paul's creations rely heavily on fresh local produce, so expect aromatic wild herbs and garlic straight from the hotel's gardens. Read more about this holiday in Family Travel Times and Family Travel Times. It's a very gentle start to the week, heading first by the river then along the north shore of the lake to St Wolfgang. Renowned for its beautiful 15th century church, this famously pretty village boasts a maze of cobbled streets lined with attractive frescoed houses, shops and cafe terraces affording superb lake views. Culture and music are very much part of St Wolfgang's fine tradition, so be sure to explore the boutique craft and chocolate shops! After lunch, hop on the antique cog railway as it chugs up to the summit of Schafberg (1782m) for unrivalled Alpine views. Keeping close to Lake Wolfgang's southern shore, a level cycling track through a tiny nature reserve brings you into lovely St Gilgen where the busy waterfront is filled with restaurants, cafes and attractive frescoed houses. Visit Mozart's museum (his mother was born here), or take the cable car up Zwolferhorn for stunning 360-degree views. Alternatively, try your hand at water skiing on Lake Wolfgang, have a cooling swim by the beach then, perhaps, enjoy an afternoon of pampering at the hotel's elegant spa. Visit the spa town of Bad Ischl today where the late Emperor Franz Josef was born - make sure you visit his Kaiservilla where the spirit of the monarchy remains strong. There are lots of restaurants for lunch and, in the afternoon, why not visit the imperial hot spa that comprises salt baths, a 30-32°C outdoor swimming pool, Alhambra baths, steam room, hammam and Oriental gardens? Return to Strobl along the banks of the River Ischl, passing tiny shrines hidden below the Leonsberg and Bleckwand peaks. Transfers included from Salzburg airport at 10:25 & 15:42 in May, and back to Salzburg airport at 08:15 & 09:45 in May. An excellent base for a single-centre holiday. The meals at the picture perfect hotel were a highlight (vegetarian? - not a problem), but it’s location set amongst meadows just a short stroll from Strobl and the lake shore was excellent. Our hosts, Jill & Colin, couldn’t do enough for us, including additional suggestions of routes and day trips to consider. There’s so much to do in this area that the bikes are almost superfluous - walking, swimming, canoeing, wake boarding, parasailing, paddle steamers, cable cars, funiculars, buses and trains. The only thing in short supply is the time to do it all! 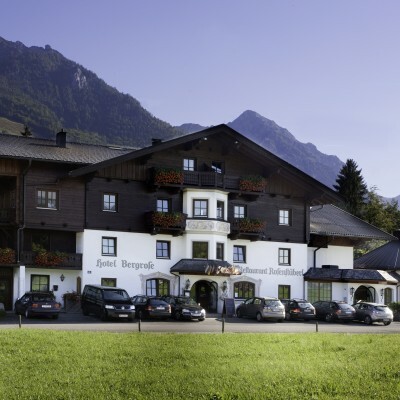 The Hotel Bergrose was a superb choice with a very spacious suite and superb meals every day. The quality of service was excellent in the hotel. The Headwater reps Colin and Jill couldn't have been more helpful. The bicycles provided were of a very high qualty. The holiday far exceeded our expectations. A great family holiday based at an ideal location for cycling in the valley and close to public transport for days out on the bus. Lovely quiet hotel just outside Strobl - the restaurant was excellent. There was so much to do, that we could choose each day to suit the weather. A great holiday. Beautiful area with plenty of opportunities for various activities including superb walks. One of the best Headwater hotels we have visited. Helped by excellent company of other Headwater clients. Always have enjoyed Headwater holidays and this is one of the best. A great location for a variety of outdoor activities, also with attractive local towns. We enjoyed all the recommended cycle rides and walks we did. On the more rainy days local bus and boat services were very helpful, and they also extended the range of possible cycling and walking trips. The Bergrose hotel was a beautiful and relaxing base; the view from our room was stunning, the food was outstanding, and the family running the hotel were eager to please. Reps Colin and Jill could not have been more helpful. We recently returned home from the Austrian Lakes activities holiday based in Strobl. Pre holiday information given by Headwater was informative and helped us to get the most out of our trip. All communication with Headwater head office was clear and promptly given. The reps in Strobl, Colin and Jill, were friendly, enthusiastic and determined to make sure we got the most out of our holiday. Despite the weather, we had an amazing time in the Wolfgangsee region. The area is stunning and there are several great day trips within walking, cycling or public transport distance from base. The family run Hotel Bergroße was like a home away from home, with relaxing gardens and a beautiful, varied breakfast and dinner menu. We would thoroughly recommend this holiday for anyone who loves outdoor activities in a relaxing, unspoilt region. We decided to extend our stay by 2 further nights to explore Salzburg in more depth, which was well worth it. This was an excellent holiday - everyone enjoyed it, including both teenage daughters (16 & 13). The hotel was superb - delicious food, helpful staff, spacious accommodation which was really beneficial as we travelled as a family and stayed in a family suite. The location and scenery of this holiday were breathtaking. I also cannot fault Colin & Gill from Headwater - they were so friendly, helpful and really did go over and above to help us (especially with the loan of a travel adapter). They were also very knowledgeable about the area and the local attractions which really made planning our stay very easy. A brilliant week at Hotel Bergrose. We were lucky with the weather so followed most of the self/guided cycle routes provided. Route instructions clear on all but one ride (feedback given to rep). Brilliant rides in nice scenery. Loved the ebikes - we had a puncture at one point and the hire company were out to us within15 mins with a replacement. Colin and Jill, our reps, were excellent. Helpful and informative and put themselves out to tinker with the bikes as needed. Fabulous experience which we recommend to anyone wondering whether to try a cycling holiday. An excellent holiday set in wonderful scenery with plenty of relaxing walking and cycling to choose from throughout the week. The hotel food, service and comfort were all fantastic. The reps Colin & Jill couldn't have been more friendly and helpful. This was our second visit to the area with Headwater and we will, no doubt, be back again. Fantastic family holiday. A beautiful area with so much to do. Bicycles provided were excellent quality. Excellent holiday - in every respect - beautiful Alpine scenery, first class bicycles and first class accommodation and food. Jill and Colin were responsive to any slight problem and gave us loads of ideas for trips etc in case the weather changed. Enjoyed the visit at Bad Ischl to the Kaiservilla but particularly the Photo Museum that Jill had suggested. They really went the extra mile! The area was fantastic for walking and cycling with the added bonus of being able to swim in the lake. All the activity off set the 5 course evening meals which were beautifully presented, the perfect size and always delicious. Excellent holiday. Colin and Jill were great, very knowledgeable and helpful. This is a brilliant holiday to suit everyone with lots to do and the flexibility to do it as and when - walking, cycling, ferry boat trips, cable cars, lazing in the garden by the river etc, all surrounded by beautiful scenery. The infrastructure for getting around makes cycling a real pleasure. And at the end of the day there's the welcome spa and delicious food waiting. Colin and Jill are excellent reps and help to make the most of the area by their knowledge and love of this part of Austria. This was our second visit ( the first 8 years ago) to Austrian Lakes Activities. We were lucky to have fantastic weather which helped. The area has outstanding scenery and views. Gentle cycle routes are not too long so you have time to explore the area and actually get to see/ do things things and not feel you are spending all day on a bike. We love the area which is why we went back a second time and were not disappointed. The Hotel is in a great location with a bus stop at the end of the road - very handy if you want a break from the bike. Hotel staff very welcoming and friendly and rooms very comfy and quiet with lovely views of the mountains. We have done several Headwater holidays now and continue to be impressed. Reps are great. Very helpful. Lovely area with a good variety of walking, cycling and sightseeing activities. Hotel Bergrosse is excellent with fabulous food, large, clean and comfortable rooms and a lovely pool and spa area along with the gardens. Austria is the perfect place for cycling as there are dedicated cycle paths everywhere. The scenery is spectacular. Plenty of opportunity to swim in the lake. Sightseeing opportunities were good and I highly recommend a visit to lovely Hallstadt. The electric bike provided by Headwater was a real boon and enhanced all the cycle rides. The weather was fantastic which added to our enjoyment of a perfect holiday. The whole holiday exceeded our expectations. Hotel wonderful and the scenery absolutely magical. Food at the hotel was world class and the staff went over the top as a daily norm. Your reps were excellent and very helpful and we would certainly recommend this holiday to anyone who likes travel and cycling. The weather was fantastic and at times a little too warm for us pensioners to cycle too much, thank goodness for the ferry and a lift back home on one occasion. A perfect mix of activities based in the most welcoming family hotel within an exquisite setting of water, woodland, pastures and mountains. The evening meals are a gastronomic tour de force without being at all heavy; the chef and his son are true artists who can conjure colours and tastes in perfect harmony - quite exceptional. We had memorable walks, cycle rides, visits to historical sites and swims and were reluctant to leave. Great fun, lots of fresh air and lovely food. Our party consisted of Grandma and Granddad (late 60's), Son (48) and Grandson (10). We were all more than catered for and thoroughly enjoyed our activity holiday. We had an informative break down of the area from our reps, Colin and Jill and the map we were given + bus timetables were very useful throughout the week. Our bicycles were easy to ride and comfortable. Our first outing was on the afternoon of arrival when we decided to visit the nearby village. There were very few days when we didn't use the bikes to visit nearby towns and villages and the routes were usually flat and safe for our 10 year old. Our grandson particularly enjoyed the toboggan run but warns other would be enthusiasts that it is possible to fall off!! He was, however, proud of his scraped leg! Got straight back on and finished the course. The grandparents tackled the cycle ride to lake Schwazen which included a steep climb. We walked some of the way as it was very hot - but we made it and were very proud of ourselves especially as there were many people overtaking us on electric bikes! (a good idea if you are not used to cycling). We particularly enjoyed our day at the Salt Mines, using the local bus and train + a ferry to get to Hallstatt (a stunning place). The salt mines were great fun and a unique experience. We also visited the Ice Caves (by local buses) - also fascinating. The boys hired an eco boat and also sampled tubing on the lake. Crazy golf and the train up the mountain was fab + the cable car up Katrin. The walk down the mountain was pretty tough, though out 10 year old completed the whole day without a murmur. Catching the bus back outside the Spar on the main road was a good idea as sustenance was required!! Last, but not least, the hotel was superb - so friendly and the food was spectacular! Thank you Headwater for a great holiday, though we did need a rest on our return. We really enjoyed our holiday. The arrangements were efficient, the hotel was comfortable if somewhat dated (it's years since I've seen one of those beige hairdriers attached to the bathroom wall in a hotel). The food was good on the whole, though with limited choice as is usual for this type of hotel in Austria not everything is going to suit everyone. The area is great for all levels of activity and the option of returning on the boat after a walk or cycle was great for us with our 7 year old. We have been to the area before so knew it would be suitable for us even if we didn't want to opt for some of the suggested things on the itinerary. Very good experience despite the travel arrangement errors. I had a fantastic week on the Austrian Lakes Adventure. Colin and Jill were very welcoming and happy to help at any stage of the holiday. The family run Hotel was also brilliant! Rather than a standard room which I was expecting, I had my very own suite including window seating and table, sofa, en-suite, balcony and ample storage. Their buffet breakfast and 5 course evening menus were always first class too. I really could not complain! As for the hiking and cycling, there were numerous notes provided which gave flexibility and choice dependent on the level of ability I was looking for. This was a great way to visit the local area and integrate with local culture. I also incorporated a day trip to Salzburg by bus. Unlike the UK, this was very easy to organise, and stress free! This was a beautiful area to visit and will highly recommend to my friends and family. Thank you all. The family activity holiday was ideal for a family of mixed ability. The cycling to Bad Ischi , Saint Wolfgang and Saint Gilgen was suitable for everyone. All the places we visited had a wide selection of coffee shops, bars and restaurants. We also did a number of walks from the hotel. The most rewarding was the 20 minute ascent of the Thersienstein which gave excellent views of Wolfgangsee. A more adventurous walk was the Brustwand Aussichtsweg, although the highlight was probably a beer at the Kleefeld on the way back to the hotel with views up the Postalm valley. We used the hotels swimming pool everyday and on the hotter days you could walk out into the garden to a selection of sun beds. The hotels facilities were excellent. We had a bedroom with a mezzanine which gave 3 sleeping areas. The public areas were very spacious and clean. The food was a modern interpretation of Austrian cuisine that was very well cooked and presentated. However if you thought it a little adventurous they would give alternatives like Wiener schnitzel and chips . Overall the holiday is highly recommended. The weather was dreadful for the entire week we spent in Austria. It was cold and rained every day. Several of the recommended restaurants and cafes remained closed because of the bad weather although it was the start of the summer season. We put on wet weather gear and did the walks anyway. It was great - we had the whole area to ourselves! The wild flowers were fantastic. It was a pleasure to come back to the Hotel Bergrose each day because we knew we could swim and sauna before dinner. The food in the hotel was excellent and we were very comfortable there. What could have been a dreary week turned out to be entirely pleasurable. We have had a superb holiday, Colin and Jill were very knowledgeable about the area and made useful suggestions with the accompanying literature about places to visit. The hotel was five star and the food deserves Michelin stars. A great week in an outstandingly beautiful area - as the notes say (and I paraphrase) any slog uphill is richly rewarded with ever more stunning views, and prices at the mountain-top cafes are the same as at the bottom, which is unusual. The weather was hot so we chose to do more cycling than walking to make our own breeze! Plenty of choice of walking and cycling routes and the teenagers were exercised adequately each day! The bicycles were good quality and very well maintained. We took the cog-railway up to Schafberg, walked up (and down) Katrin from Nussensee (which was a hard day's walk) and cycled to Bad Ischl, St Wolfgang, St Gilgen and Schwarzensee - that last one was hard too and we wished we'd taken our swimming stuff to cool off in the glorious lake! We added our own 4-night stay in Munich (including organising our own travel from Strobl and afterwards to Munich airport) and Headwater were happy to arrange our flight around this. We felt that everything had been carefully thought out and researched which meant we could just relax and enjoy ourselves. 7 of us shared this holiday. We ranged in age from 10 to 73 and we all had a great time. The wonderful weather helped in this very good location. We were very impressed with the efficient Austrian people,in the delightful Bergrose hotel and all the little farms, ,houses and neat, tidy floral gardens. It was a joy to cycle around. the scenery was spectacular. We particularly enjoyed the lake at Stroble as well as the bike rides to StWolfgang, St Gilgen and Bad Ischl and the ferry to Hallstatt.. The children were always busy and after dinner had a very competitive table tennis match. A very good family holiday! The area is lovely & the bike rides & walking a real joy. With spas in Bad Ischal, Salt mines to explore, & cable cars plus the schafgerg railway you are never stuck for things to do. Be careful which time of the year you choose to go to the Austrian lakes - it rained most of the time we were there! A very good weeks holiday cycling around a beautiful lake which was also wonderful to swim in. The hotel was comfortable and quiet with delicious food and a lovely garden. It was also in an excellent location for exploring the area by bike. Another superb Headwater holiday - everything perfect as always. 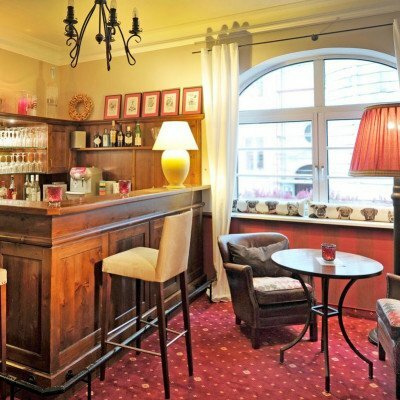 We added three nights at the Weisses Kreuz Hotel in Bregenz which was also excellent. A very good holiday, despite rather variable weather. Fortunately the excellent bus connections from near the hotel made getting to Salzburg and Bad Ischl very easy on the really wet days. The general cool temperatures were probably not a bad thing when it came to cycling and walking. The hotel proved a splendidly welcoming environment each evening. Independent multi-activity holiday Managed locally by Headwater appointed rep.
Saturdays from 18th May 2019 to 12th Oct 2019, for 7 nights. All dates are subject to availability, please contact us to check. 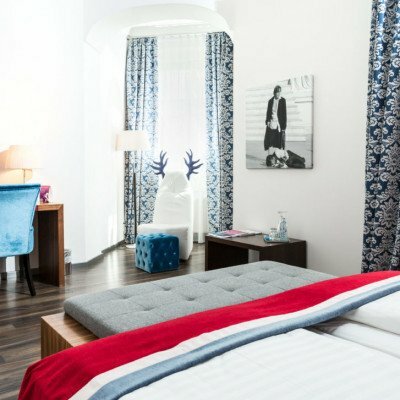 'Twin-bedded rooms in Austrian resorts are normally one large base with two mattresses/duvets. These are also known as 'Austrian Twins' and are regarded as two beds. Separate twin beds are rare and cannot be guaranteed as available'. Due to the tailor-made nature of our holidays, we need a little more information in order for us to check availability for Austrian Lakes Activities. Simply complete the form below and a member of our sales team will contact you (when it's most convenient for you) to provide availability information, travel options and an accurate price. Of course there's no obligation, but if you do wish to proceed with a booking they will be on-hand to assist you throughout the process.